Camping in the great outdoors doesn’t have to be an uncomfortable experience. Sleeping on a pad is possible, but for the utmost comfort, a portable air mattress or sleeping on a camping cot is recommended. The best camping cot will give you a great night’s sleep and make you forget that you’re out in the wilderness, until you wake up refreshed and ready to explore another day! 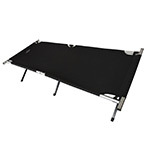 A camping cot isn’t just suitable for camping trips. You may also want one to act as a spare bed in your home. They can be great for replacing an air mattress. The one you choose will depend on your specific needs! The reality is that you’ll only use a cot if you’re car camping. They aren’t going to be part of a backpacking trip. Still you want a reasonably portable camping cot. It shouldn’t be too heavy to haul from the car and it should be straight forward to unfold and setup. Once you’ve finished with it, it should fold to a fairly compact size. Whether you sleep on your back or you’re a side sleeper a comfortable camping bed should offer a reasonable upgrade over a sleeping bag and camping pad solution. The frame of the cot shouldn’t in anyway impede on the use. Furthermore anyone else sleeping in the same space won’t want to here the cot creaking if the user moves around. This effects the comfort of other campers. Cots cost a reasonable amount of money for a decent product. You should therefore expect your purchase to be pretty durable and last a few seasons. Contributing to durability are the materials selected in construction. The surface should be taut and flat, springs should be quiet and the frame while being strong should be light. Lighter products will be made of aluminum while heavier options will be made with stronger steel. Here are some of the most popular portable camping cots compared, so you can find the best one for your trip or spare room. If you don’t have time to read the full reviews then check out our comparison table below. With this cot, the setup is super simple. The cot is pretty big, which is great if you want something substantial. Just be warned if you have a smaller tent like a pop-up to measure before purchasing. The cot is comfortable and sturdy even for side sleepers who may struggle with sagging on some cot beds. The fact that the frame and any metal parts are covered with soft material also increases comfort. There’s no locking mechanism on the legs, however this doesn’t mean it will collapse, it simply means that you may worry about it collapsing. Locking mechanisms can bring peace of mind. The weight of your body will be enough to keep it in place though. The size and weight of the cot is 8 x 9 x 42 inches, and 21 inches high when set up. The value for money is pretty good. One of the unique features of this bed is that it makes much less noise than other cot beds you might find on the market! If you’re a bit fidgety buyers have reported that it doesn’t creak or squeak so much. Overall the Kamp-Rite Kwik Cot is a good camping cot to go for. 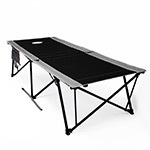 It’s more than suitable for tall people, and people who need comfort for their joints and back. If you have light sleepers in your party then they will also appreciate the creak free use. This is also a good option for side sleepers as the surface is taught and doesn’t sag as much as others. The only let down is the lack of a locking mechanism to the legs. 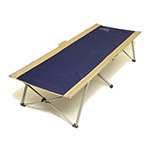 Having inspected the cot this is unlikely to cause any issues so overall we highly recommend this camping cot. The side storage is also a nice bonus. This cot’s setup isn’t too difficult but it does prove harder to take down as the pad has to be separated from the main frame. If you have plenty of space and an extra pair of hands then this won’t prove difficult. In a tight tent or a small spare room though it’s a challenge. Comfort is really good to begin with, the included pad is thick with foam and it covers all the metal framework. Some users do report sagging though after extended use which might get worse if your a side sleeper putting more pressure down the middle. This can mean the cot is OK when you first use it, but begins to deteriorate over time. The size is 11.25 x 10 x 39.5 inches, and it’s not too heavy either, so could be good for camping trips. It doesn’t fold down as neatly as the Kamp-Right model though. Overall this offers good value for money is pretty good it just does everything to a decent standard which you would at least expect from a brand like Coleman. The Coleman Comfortsmart Cot is a good cot but perhaps not the best out there for the money. That being said, it isn’t the worst one either. It makes a decent replacement for air mattresses and can be suited to even picky sleepers in the right conditions. It’s also suitable for those who are taller and heavier so given the big brand it’s likely to find plenty of fans. The Teton cot on first appearance looks very well made and the manufacturer likes to show off how strong it is. The cot measures 17 x 25 x 75 inches, so a reasonable size for most. The construction certainly looks good. However some users have remarked that the setup bars on this cot can be difficult to snap into place. Furthermore there are reports of nuts and bolts coming loose after only a few uses. It’s fair to say though that of the people that have contacted customer services with issues they have been resolved without quibble by Teton. So is this a comfortable cot? Well reviews have been mixed in this respect. It doesn’t look as comfy as the Coleman and larger users have said you’d be better off with the XXL version. If you’re a smaller person you’ll likely be OK though there have been reports of sagging and tears to the material after extended use. Perhaps this cot is better for camping rather than everyday use in a bedroom or for sleepovers. The Teton Sport with so many mixed reviews is perhaps not the best product to spend your money on. If you look at the product on Amazon you will see plenty of good reviews but scratch under the surface and there are just too many niggles. The metal bars are not sturdy and don’t always snap into place, reports of material sagging and tears, the list goes on. With such a good pedigree for these kind of products it’s a shame to be writing this review of a Teton product. Still many do report of excellent customer service should you encounter an issue. Why bother though, if you want a good night’s rest, or you’re purchasing for guests, hedge your bets and go with something more reliable from the outset. The setup of this cot is easy enough, just fold out from the center and then turn the legs out to lock. Simple. It’s apparent that these are also robust products and the manufacturer claims it will hold up to 300lbs. It’s also an attractive enough product with 5 color options one of them being cammo for all you hunters or survival folk. The legs are also sturdy, made of steel and coated in a clean white finish. The middle leg incorporates a top bar for support. Unfortunately heavier users may well notice this sticking in their back. This can impede the comfort of the cot, especially if you are a heavier male. On the positive side there is clearance underneath for plenty of camping gear. Being a larger product it’s also suitable for those who are up to 6ft tall. In terms of value for money it’s a pretty good product, especially if you’re somebody looking for something sturdy for a taller person. 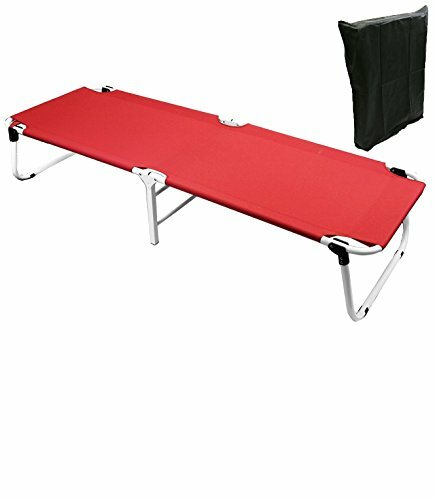 The Magshion Military Portable Camping Cot is pretty good but may not be the best choice if comfort is your number one priority, especially if you are on the heavier side. The color is attractive and stands out well, so you can spot it if you’re arriving back to your tent at night time. If you’re a tall slim person it could well be the best choice here. The set up of this cot is ridiculously easy – many sleeping cots for camping are notoriously hard to put together but this product unfolds and folds back up with ease. The framework though a little heavy is very well engineered and it’s this, combined with the 600 denier polyester, that will support weights of up to 325lbs. 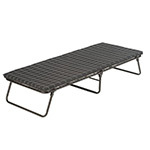 As mentioned the one gripe many people have with this cot is that it’s quite heavy, which can mean it isn’t great if you’re camping long distances and need to take it from place to place. 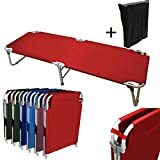 For car campers though it’s perfect, unfold and forget. You just might need a little bit of upper body strength in the first instance. In terms of value for money, it’s one of the most expensive. That being said, the pros and comfort of the cot more than make up for it. It’s far superior to air mattresses, and will offer a great night’s sleep to most people. Overall, this camping cot is one of the best you’ll find for the price. While it might be heavy, the comfort and ease of use makes up for it. It also makes a comfortable camping bed for somebody who is larger than average in size. Final Verdict – Which is the best camping cot of this bunch? 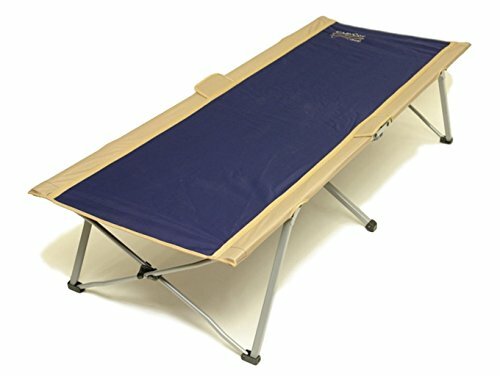 All of the camping cot reviews on this list have their own unique pros and cons. However, one clear winner has been found among them all! The Easy Cot, Portable Folding Cot is by far the best camping cot out there. The comfort and value for money is unbelievable, and you’ll only experience this for yourself when you test it out. Of course the one con to this camping cot is that it’s pretty heavy, it’s weighty because it’s well made and built to last which also makes it the best heavy duty cot on test. For those that want a lighter option we have also declared a runner up. 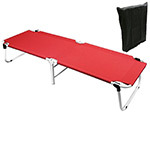 The Kamp-Rite Oversize Kwik Cot may not be as comfortable or easy to use as the Easy Cot, but it’s a close second. The one benefit it has over the winner is that it is much lighter, so may be more suitable for camping trips where portability is important. Not every camping cot reviewed on the list is OK to use. Some of them are underwhelming at best, but the one that is best avoided is the TETON Sports Adventurer Camp Cot. This cot has few redeeming features. It may appear to work just fine when you first set it up, but the sagging and noise that can come with it after use just lets it down. Whether you’re looking for a camping cot to replace an air mattress/spare bed, or one to go camping with, the winner and the runner up on the list could be suited to your needs. For a spare room, or trips where you won’t need to carry the bed, the The Easy Cot, Portable Folding Cot is your number one choice. For camping trips, especially ones where you will be carrying your bed, the The Kamp-Rite Oversize Kwik Cot is a safe option and this is also the best camping cot for side sleepers. To make sleeping on a cot even more comfortable partner either of these with a good quality sleeping pad and a sleeping bag and you have a great sleep system. Thanks for the review. You may find it interesting that, according to the specs on amazon, the Easy Cot is two pounds lighter than the Camp-Rite Oversize.